Study question To determine if placing a senior doctor at triage versus standard single nurse in a hospital emergency department (ED) improves ED performance by reviewing evidence from comparative design studies using several quality indicators. Data sources Cochrane Library, MEDLINE, EMBASE, CINAHL, Cochrane Effective Practice and Organisation of Care (EPOC), Web of Science, Clinical Trials Registry website. In addition, references from included studies and citation searches were used to identify relevant studies. Review methods Databases were searched for comparative studies examining the role of senior doctor triage (SDT), published from 1994 to 2014. Senior doctor was defined as a qualified medical doctor who completed high specialty training in emergency medicine. Articles with a primary aim to investigate the effect of SDT on ED quality indicators such as waiting time (WT), length of stay (LOS), left without being seen (LWBS) and left without treatment complete (LWTC) were included. Articles examining the adverse events and cost associated with SDT were also included. Only studies with a control group, either in a randomised controlled trial (RCT) or in an observational study with historical controls, were included. The systematic literature search was followed by assessment of relevance and risk of bias in each individual study fulfilling the inclusion criteria using the Effective Public Health Practice Project (EPHPP) bias tool. Data extraction was based on a form designed and piloted by the authors for dichotomous and continuous data. Data synthesis Narrative synthesis and meta-analysis of homogenous data were performed. Results Of 4506 articles identified, 25 relevant studies were retrieved; 12 were of the weak pre-post study design, 9 were of moderate quality and 4 were of strong quality. The majority of the studies revealed improvements in ED performance measures favouring SDT. Pooled results from two Canadian RCTs showed a significant reduction in LOS of medium acuity patients (weighted means difference (WMD) −26.26 min, 95% CI −38.50 to −14.01). Another two RCTs revealed a significant reduction in WT (WMD −26.17 min, 95% CI −31.68 to −20.65). LWBS was reduced in two Canadian RCTs (risk ratio (RR)=0.79, 95% CI 0.66 to 0.94). This was echoed by the majority of pre-post study designs. SDT did not change the occurrence of adverse events. No clear benefit of SDT in terms of patient satisfaction or cost effectiveness could be identified. Conclusions This review demonstrates that SDT can be an effective measure to enhance ED performance, although cost versus benefit analysis is needed. The potential high risk of bias in the evidence identified, however, mandates more robust multicentred studies to confirm these findings. On the other hand, several interventions have been implemented to improve throughput or patient flow. Nurse triage is currently the standard triage model in the majority of hospitals throughout the world.5 Nonetheless, there seems to be a rising concern among policy makers as to whether or not this older model is effective enough in the face of increased ED crowding worldwide.5 Two reviews have summarised succinctly the numerous throughput interventions aimed at improving ED flow such as nurse-requested X-ray, physician liaison triage and rapid assessment zones.6 ,7 Recently, the Royal College of Emergency Medicine in the UK suggested rapid senior assessment of patients within their recommendations to reduce ED crowding.1 ,8 In fact, there seems to be a growing interest in, and use of, senior doctor triage (SDT). SDT involves placing a senior emergency doctor in triage so that they can identify potential emergencies, initiate diagnostic workups and treatment for patients prior to being seen in the main ED. Previously, Rowe et al reviewed evidence on doctor triage in a broad context which included junior, middle grade or senior doctors.7 In some of their included studies, the intervention was fulfilled by a doctor, a nurse practitioner or a physician assistant.9 ,10 Furthermore, they depended heavily on abstract-only studies. In comparison, this current review adopts a tight focus looking specifically at the role of the ‘senior’ doctor in early assessment at triage. An increasing amount of evidence assesses the benefits and risks of a senior doctor assessment at triage. The objective of this systematic review is to synthesise comparative studies available in the literature which explore the impact of SDT versus the standard single nurse triage on ED performance measures. This should allow decision making ED clinicians to draw conclusions with respect to applying this intervention to their own practice. Methods of the analysis and inclusion criteria were specified in advance and documented in a protocol.11 Review registration number: CRD42014010143. Extensive search of the following electronic databases was undertaken to identify relevant studies: MEDLINE, EMBASE, CINAHL, Cochrane Effective Practice and Organisation of Care (EPOC), Cochrane Library, Web of Science and Clinical.trial.gov. This was accompanied by searching citation indices, secondary references, grey literature and hand searching through the archives of key journals. Literature for inclusion in the review was restricted to the period (1994–2014) in order to keep the information as relevant as possible. See on-line supplementary 1 for search strategy. Articles were excluded if they were (1) non-comparative descriptive studies; (2) abstract-only studies; (3) published in a language other than English; (4) investigated specific patient illnesses; (5) the intervention (senior doctor) was allocated to other duties in the ED, for example, seeing ‘clerked’ patients, administrative work or teaching and supervision; (6) interventions that employed primary care physicians or general physicians in triage and (7) evaluated ‘see and treat’ or ‘fast track’ schemes. Irrelevant studies and duplicate publications were removed via screening of titles. Following this title sift, the researchers selected the studies according to the predetermined inclusion and exclusion criteria. This was achieved by reading the abstracts or full texts if necessary. The authors were contacted to retrieve the qualification of the doctor if not clearly stated. A specifically designed and piloted form developed by the lead author was used for data extraction. Data extracted for continuous outcomes included mean, SD and sample size for each group. SD was sometimes calculated from CIs or p value. For the purpose of the review, where only medians and IQR were reported, medians were accepted as means and SD was estimated using this formula: ‘SD=IQR/1.35’.13 This process was performed by one reviewer and verified by the other authors. Each included study was evaluated for the risk of bias and study design using the Effective Public Health Practice Project (EPHPP) quality assessment tool.14 This tool accounts for the different study designs of the included studies. The EPHPP tool examined each study against six dimensions, namely selection bias, study design, confounders, blinding, data collection methods, withdrawals and dropouts. Finally, the quality of each article was graded as strong, moderate or weak according to the individual ratings attributed to each dimension. Narrative synthesis was completed. A table of the findings was produced to summarise the population, design and intervention of each study. Heterogeneity between studies was assessed using the I2 statistic. Homogenous studies were statistically summarised and meta-analysed. The meta-analyses were performed by computing risk ratios (RRs) and weighted means difference (WMD) with 95% CI using a random effects model, as it provides a more conservative estimate of the effect size. If meta-analysis was not feasible due to high heterogeneity (I2 >90%), weighted means or RRs were calculated for all studies for a given outcome to provide a non-meta-analytic comparison for each result. This was carried out using the Review Manager program (RevMan5.2). Subgroup analyses, by study design, intervention type (senior-led team vs senior doctor and nurse triage) and population type (medium acuity patients: Canadian Triage and Acuity Scale 3 (CTAS 3) or equivalent), were conducted if feasible. Sensitivity analysis was planned according to study design and methodological quality. Symmetry of funnel plots was used to assess for publication bias. The initial search identified 4506 abstracts, which were evaluated for relevance. Fifty-five studies were considered potentially relevant and evaluated in full text. In addition, two studies were found through citation searching and secondary references. Ultimately, 25 studies were selected based on the predetermined eligibility criteria. See on-line supplementary 2, 3 for Preferred Reporting Items for Systematic Reviews and Meta-Analyses (PRISMA) chart and list of excluded studies, respectively. Two studies evaluated senior doctor-only triage where the senior doctor alone was responsible for assessing patients and initiating treatment.18 ,30 A further group of eight studies, including two Canadian RCTs, examined the presence of combined senior doctor and nurse triage.16 ,17 ,22 ,27 ,28 ,34 ,35 ,38 In the final group of 15 studies, the intervention was a senior doctor-led team triage where the senior doctor was accompanied by a team of other health professionals such as nurses and technicians. In five of these studies, the team included junior doctors in addition to nurses or technicians.24 ,31 ,32 ,36 ,37 See table 1. The population of the ED patients appeared comparable across the included studies. Fourteen studies documented age, gender and mode of arrival to ED. In 12 of these studies, patients were middle aged with neither gender being predominant. Nineteen studies reported on LOS, including four RCTs. Two Canadian RCTs by Cheng et al and Holroyd et al revealed a significant reduction in LOS with combined senior doctor and nurse triage.34 ,35 This was not the case in the remaining two RCTs,36 ,37 including an Australian study by Davis et al where a Senior Work-up Assessment and Treatment (SWAT) model was associated with a 6 min increase in LOS.37 High heterogeneity did not allow pooled estimates to be provided. All non-RCTs except three16 ,17 ,31 were associated with a significant reduction in LOS with a median decrease of 26 min (IQR −6 to −56) (figure 1). 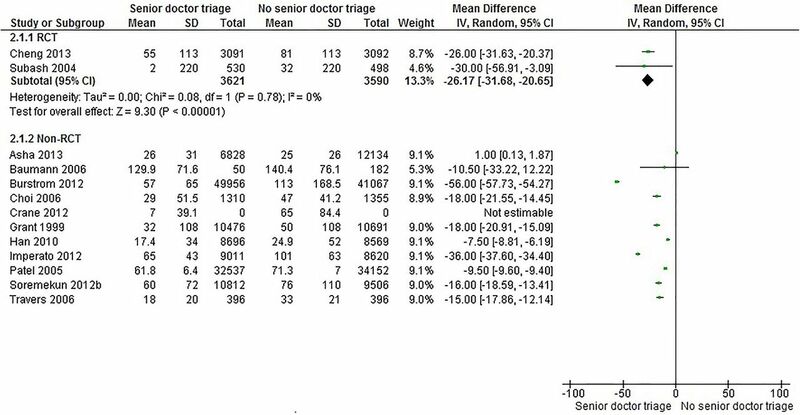 Impact of senior doctor triage on length of stay (LOS, min). Subgroup analysis according to patient acuity was conducted. A pooled result from two homogeneous Canadian RCTs34 ,35 reported a significant reduction in LOS for medium acuity patients (CTAS 3) with combined senior doctor and nurse triage (WMD −26.26 95% CI −38.50 to −14.01). The remaining RCTs by Subash et al and Davis et al did not present LOS according to patients’ acuity and were not included in the analysis. The effect of SDT on medium acuity patients in non-RCT studies was similar with a median decrease of 29 min (IQR −6 to −56). A subgroup analysis in accordance with the intervention type (single senior doctor, senior doctor and nurse, senior-led team) did not explain the high heterogeneity (I2=99) among the included studies. 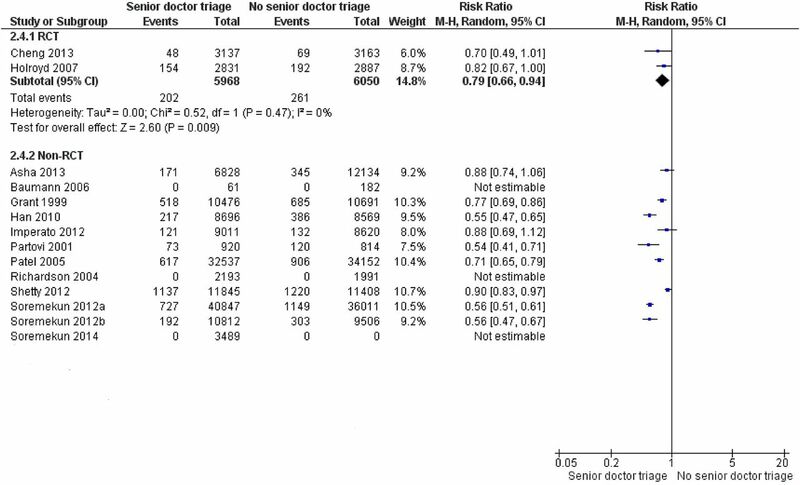 A median decrease in LOS for senior doctor-led team triage was also 29 min (IQR −6 to −56). Sensitivity analysis was not possible owing to the high heterogeneity of the studies. Thirteen studies reported outcome data on WT to see a doctor. Two RCTs by Cheng et al and Subash et al revealed a significant reduction in WT in association with SDT (WMD −26.17 min, 95% CI −31.68 to −20.65).34 ,36 The RCTs by Holroyd and Davis did not report WT. All non-RCTs except two31 ,33 showed a significant reduction in this indicator with a median reduction of −15 min (IQR—7.5 to −18) (figure 2). 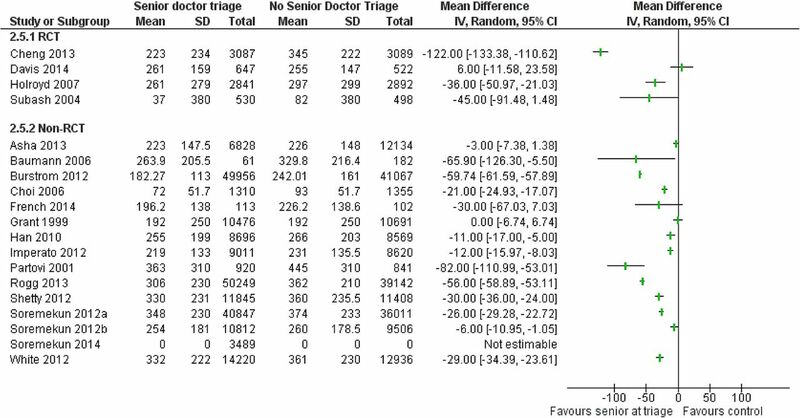 Impact of senior doctor triage on waiting time (WT, min). Impact of senior doctor triage on the number of patients who left without being seen (LWBS). Patient satisfaction was reported in six studies17 ,19 ,21 ,28 ,30 ,38 using different survey tools. Three non-RCTs compared patient satisfaction in intervention and control periods.17 ,19 ,30 Two of these studies revealed no change in patient satisfaction.17 ,30 In contrast, a study by Imperato et al showed a significant improvement in patient satisfaction with SDT (RR=0.16, 95% CI 0.04 to 0.28).19 Three studies evaluated patient satisfaction on intervention days only21 ,28 ,38 and found it to be high. Visual inspection of the asymmetric funnel plots suggests the possibility of publication bias (figure 4). Funnel plots of mean effects of senior doctor triage on length of stay and waiting time. The asymmetry in funnel plots suggests the possibility of publication bias. Each dot represents a study. The Y-axis represents the size of each study, while the X-axis represents the result of each study. MD, mean difference; RCT, randomised controlled trial. The majority of studies concluded that dedicating a senior doctor in triage reduced the WT for patients to see a doctor, decreased the LOS and lowered the proportion of LWBS patients as well as the proportion of LWTC patients. Nevertheless, the impact of this model on patient satisfaction was not consistent across the studies. The cost effectiveness of this triage model could not be established from the available evidence. It is important to differentiate SDT from fast track or ‘see and treat’ models. Fast tracking often targets patients with a specific illness such as chest pain for rapid life-saving intervention. Several studies included in the review have a separate fast track unit running in their ED. This review demonstrates that SDT positively impacted the total LOS across the majority of the studies reporting this outcome. After performing subgroup analysis, a pooled result from two strong quality Canadian RCTs34 ,35 revealed around half an hour reduction in LOS associated with senior doctor and nurse triage of medium acuity patients. A good quality BA study, that considered seasonal variation and a potential Hawthorne effect, showed a sustainable reduction in LOS over a 3-year period after the introduction of a senior doctor-led team triage.23 Although a well-conducted RCT by Davis et al37 stated no significant difference in LOS with SDT, a subgroup of discharged patients revealed a significant reduction in LOS associated with SWAT model. This reduction in LOS may be explained by shorter WT as the senior doctor is involved early in the patient journey. Previous studies have shown that different factors can be responsible for variation in LOS, including daily admissions, discharges and timing of presentations.40 The asymmetric funnel plot, however, suggests the possibility of publication bias. This is a cautionary finding to be considered in the interpretation of the results of this review. Lastly, the majority of studies did not include a resource and cost analysis, or address the safety profile of SDT in terms of mortality or unplanned re-attendances. Studies often neglected to report these essential outcomes. This review has certain strong points. It employed a comprehensive approach to assess risk of bias in the included studies. This allowed the reviewer to detect any internal or external validity threats in individual studies. Furthermore, since few systematic reviews focus on innovations in ED operations,7 ,45 this review is of potential value to ED clinicians as well as policy makers as an up-to-date summary of the literature on SDT. The limitations of this review must also be acknowledged. The main limitation is that the patient population and outcome definitions are not standardised across the studies. One could argue that an overall consistent effect across a majority of the studies, notwithstanding the heterogeneous nature of those studies, should allow more global conclusions to be drawn.46 Moreover, subgroup analysis was performed in an attempt to facilitate more meaningful comparisons. Second, the majority of studies employed a retrospective, single-centre design with a lack of randomisation. Only four randomised trials could be found .This has implications for the internal validity and the applicability of any conclusions made. Finally, publication and language bias might account for some of the observed effect. The logical next step for future research would be to confirm the review findings with more robust multicentric studies to determine if SDT provides safe, sustainable and cost-effective gains. Work is also required to develop an international ED outcome measurement tool and to use this tool as a basis for collaborative research and comparative evaluation. Lastly, qualitative research is needed to gain a better understanding of senior doctor views with regard to undertaking a possibly stressful and highly pressurised role of early initial assessment at triage. In this review, SDT was associated with improvements in numerous ED metrics in most included studies (eg, Cheng et al, Imperato et al 2014 and Shetty et al). SDT may represent a valuable solution for ED managers and administrators in the battle of ED overcrowding. Unfortunately, the evidence is not sufficiently robust to support this transition. Future research should investigate and evaluate the benefits, costs and sustainability of senior initial assessment at triage through multicentric cluster RCTs and qualitative research. The authors thank Mrs Claire Beecroft for her assistance in conducting the literature search and Mr Mike Bradburn for his assistance with meta-analysis. The authors also thank Dr Lena Burstorm, Dr Ivy Cheng, Dr Brian Rowe, Jascinth Lindo and Dr Olanrewaju Soremekun who kindly answered questions regarding their published studies.
. Crowding in emergency departments. 3rd edn. The College of Emergency Medicine. 2014.
. The relationship between emergency department crowding and patient outcomes: a systematic review. J Nurs Scholarsh 2014;46:106–15. doi:10.1111/jnu. Urgent and Emergency Care. Improving urgent and emergency care performance across NHS South of England. The King's Fund, 2013.
. International prospective register of systematic reviews. The impact of senior doctor assessment at triage on emergency department performance measures: systematic review and meta-analysis of comparative studies. Centre for Reviews and Dissemination, 2014.
. Selecting studies and collecting data. In: Higgins J, Green S, eds. Cochrane handbook for systematic reviews. Cochrane book series. UK: Blackwell, 2008:176. Effective public health practice project (EPHPP) quality assessment tool for quantitative studies. http://www.ephpp.ca/tools.html (accessed Jun 2013).
. Avoiding prolonged waiting time during busy periods in the emergency department : is there a role for the senior emergency physician in triage? Eur J Emerg Med 2006;13:342–8.
. Team triage: addressing challenges to emergency department flow. Journal of Healthcare Quality 2006;28: W4-3–9.
. Experimental research. In: Gerrish K, Lacey A, eds. The research process in nursing. 6th edn. UK: Blackwell, 2010:203.
. Prioritizing performance measurement for emergency department care: consensus on evidence- based quality of care indicators. CJEM 2011;13:300–9.
. Overview of strengths and limitations of systematic reviews and meta-analyses. In: Chiappelli F, ed. Evidence based practice: toward optimizing clinical outcomes. Berlin, Heidelberg: Springer, 2010. Contributors All authors contributed to the concept and design of the review. AB, MK and SMM contributed to the design of the systematic review, reviewing papers for inclusion and exclusion and writing the paper. MAA undertook the systematic review. All authors contributed to analysis and interpretation of the data. MAA drafted the article; all other authors revised it critically and approved the final version submitted. Funding This paper presents independent research by the National Institute for Health Research Collaboration for Leadership in Applied Health Research and Care Yorkshire and Humber (NIHR CLAHRC YH). http://www.clahrc-yh.nir.ac.uk. The views and opinions expressed are those of the authors, and not necessarily those of the NHS, the NIHR or the Department of Health.